Tha Balkani Wildlife Society and BBPS Semperviva work closely together at their base in Vlahi. A few years ago, a project house was built in the traditional Bulgarian style which provides shelter for the various animals such as sheep, goats and horses in a barn area adjoining the house. The living accommodation provides basic but comfortable facilities for project workers, volunteers and visitors. Life is hard in Vlahi, but also rewarding. Each day is filled with the hustle and bustle of rearing livestock, training livestock guarding dogs, carrying out research on wolves and bears, and providing education and awareness-raising activities. Every morning, the sheep and goats are taken up to pasture in the mountains accompanied by one of the shepherds and at least three livestock guarding dogs. Amidst all of this, the team have to cater for volunteers and visitors and carry out field research on wolves and bears in the area. Vlahi is the gateway to the Pirin National Park, which is a UNESCO World Heritage Site. The village itself was, until recently, largely derelict, having been overlooked and forgotten under the previous communist party. The project is breathing new life into the village, and as well as the Education Centre and the project house, another large barn has been built to house some of the goats and sheep. Employment for local shepherds and craftspeople is also boosting the local economy. Products from the sheep’s wool such as chunky jumpers, mittens, scarves and hats are proving very popular. In turn this has revived production of some of the other local products made by craftspeople which were in danger of dying out. Jewellery, lace and linen products are all sold at the project. It is not all good news and plain sailing however as the project comes under persecution from the local hunters who try to stop the progress by poisoning herd protection dogs and vandalising the centre. 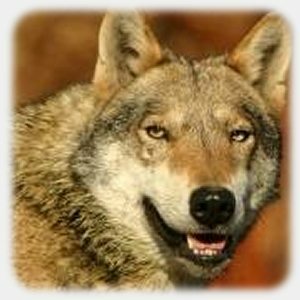 Much work is still to be done before the wolf is finally protected in Bulgaria. For further details, please see this article from Wolf Print issue 28. Also available for view is information from students who have visited the project on our student exchange programme. Since 2005 a total of £52,200 has been donated by the UK Wolf Conservation Trust to the Balkani Wildlife Society in Bulgaria, helped by a large donation from Bacardi who launched a vodka product called Eristoff which means land of the wolf.